I'm just wondering if there's a minimum age the paints can be used by? The minimum age recommendation for these paints is 3+ due to the small cap. A handy replenishment addition to any busy nursery or primary school, our Gompels Assorted Ready Mixed Paint 600ml 20 Pack promises to offer hours of fun. Gather the class together for an engaging and inspiring crafting session and allow them to create dazzling masterpieces with this wide array of colour options. Each colour is packed into a handy and flexible bottle that can be squeezed for even distribution. Colours supplied: 4 x White, 2 x Red, 2 x Blue, 2 x Yellow, 2 x Black, Sky Blue, Lemon, Orange, Crimson, Purple, Green, Leaf Green and Burnt Amber. Protect their clothes from damage with our Children's Play Aprons while encouraging them to explore different colour variations with the Economy Paint Palettes. 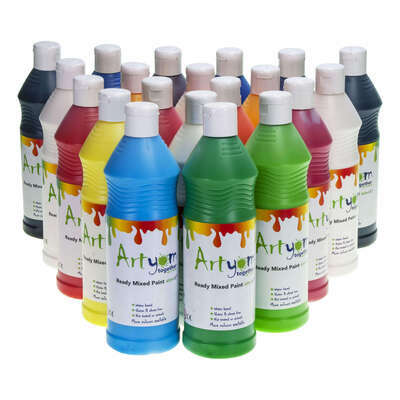 We also stock Large Stable Waterpots and Jumbo Easy Grip Paint Brushes.